Racepak's IQ3 Dash Displays are optimized for the racer who needs to view vital functions quickly and easily. The IQ3 is offered in a variety of display settings (including logger, drag logger, street, street logger) and each can display up to 28 inputs on four pages, allowing the most critical data to be viewed at a glance. All IQ3 dashes feature programmable shift lights and warning lights, gear indicator, and the ability to display lap times, predictive lap and best lap. The IQ3 has an LCD display with a blue backlight that is viewable in any lighting condition for a top-tier dash readout. 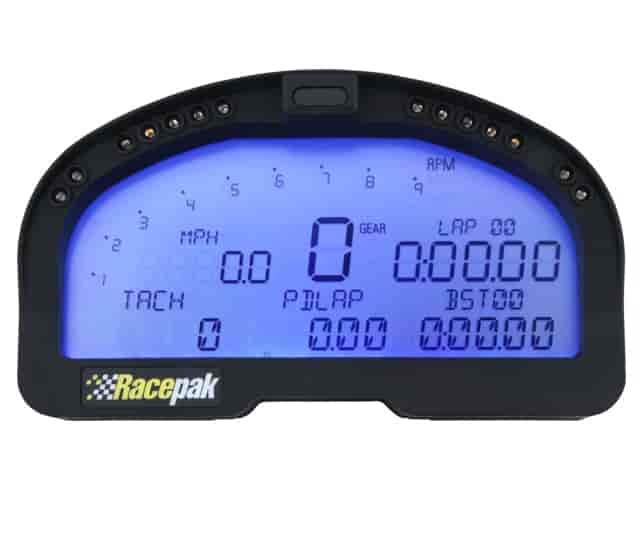 Racepak offers these dash displays with or with a data logger and they can be utilized with any of Racepak's V-Net data loggers. Dashes can also be used as a standalone display through the use of the optional sensor, off of the rear V-net port. Is this a can-bus system? This runs on its own system, but we have seen can-bus data integrated into the display.